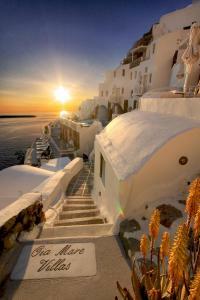 Oia Mare Villas is located on the cliff of La Caldera, in the center of the town of Oia. 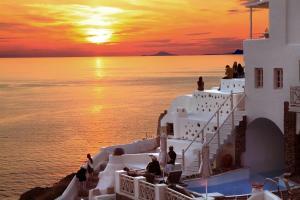 It offers views of the Aegean Sea, the Caldera and Theraia Island. Please inform Oia Mare Villas in advance of your expected arrival time. For this, you can use the special requests section when making the reservation or contact the accommodation directly. The contact details appear on the booking confirmation. From the 1 from May to the 30 from September, minors under 12 can not stay at the Oia Mare Villas. Please read carefully the instructions for the check-in that the Oia Mare Villas will provide you once the reservation is confirmed. The photographs of the rooms are just a sample of the room type. It is not guaranteed that the assigned room is the one shown in the photographs. Additional charges apply for additional guests (see hotel conditions). Decorated in the Cycladic style, this studio offers air conditioning, a flat-screen satellite TV and a private balcony with views of the caldera and the Aegean Sea. Decorated in the Cycladic style, this air-conditioned studio includes a living area with a flat-screen satellite TV and a private balcony with views of the caldera and the Aegean Sea. Offering a private balcony with views over the caldera and the Aegean Sea, this air-conditioned and Cycladic-style suite is traditionally decorated. It features a seating area with flat screen, satellite TV and dining area. 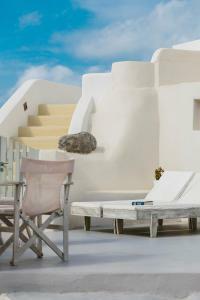 This suite of 2 bedrooms is decorated in a traditional Cycladic style with whitewashed walls and built-in beds. 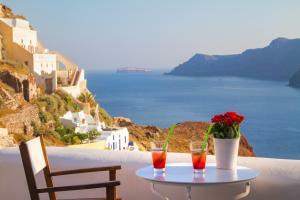 It has a private balcony with views of the caldera and the Aegean Sea. It also has a dining area and a spacious living area with a flat-screen satellite TV. Decorated in the Cycladic style, this suite offers air conditioning, a seating area, a dining area and a private balcony with views of the caldera and the Aegean Sea. It also includes a safe and a hairdryer. Spacious room decorated in a traditional Cycladic style. Overlooking the Aegean Sea, this air-conditioned room has a seating area with a flat-screen satellite TV and a mini-fridge. Offering a hot tub and a private balcony with views over the caldera and the Aegean Sea, this air-conditioned and Cycladic-style suite is traditionally decorated. It features a seating area with flat screen, satellite TV and dining area. 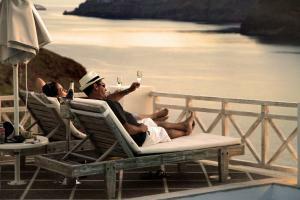 This air-conditioned suite features an outdoor hot tub and a private balcony with views of the caldera and the Aegean Sea. It has a decoration in a traditional style of the Cyclades. It includes a seating area with a flat-screen satellite TV and a dining area.